70 Years On – from 1949 to 2019 – A year of celebration for our family business! Being awarded the fantastic accolade of ‘Family Business of the Year 2017’ for London and the South East was true testimony to our many years as a business and to our Greek family heritage. 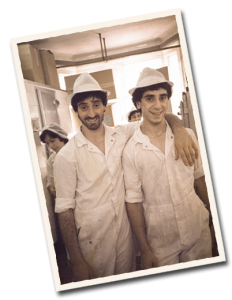 Founded in a basement workroom in Warren Street, London, in 1949 by our uncle, Euripides Nicolaou, who was then joined by our father, Michael Timotheou, the four of us (brothers Chris, Peter, Bides and Tony) continue to run the business today. This is a year of celebration for us as we reach our 70th year. 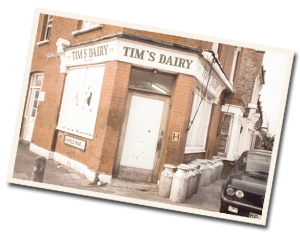 The very early days started in central and north London, producing yogurts in small batches by hand at the back of a shop. 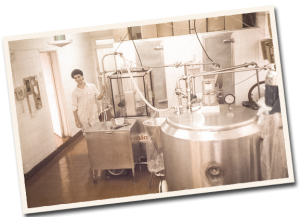 Post war consumers were not familiar with yogurt, so at first we made natural yogurts and creamy milk desserts for restaurants, delis and cafés. Production in those days was very hands-on with all the family playing their part to ensure the best in quality. Five-gallon milk churns were delivered fresh daily to the doorstep – instead of bottles of milk – which always raised a smile from the neighbours! All eight of us had to help out – washing the glass pots, sealing the fresh yogurts and learning the intricacies of our forefathers’ yogurt recipe. 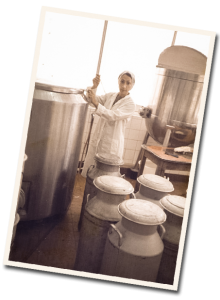 In 1996 we moved to a former dairy site in Chalfont St Peter in Buckinghamshire, where we continue to produce our yogurts and cultured creams today. Heritage, passion and skill are still at the heart of every pot, so that the quality and great taste people enjoyed all those years ago can still be savoured today. These are exciting times at Tims Dairy. It is currently managed by brothers Chris, Peter, Bides and Tony Timotheou. Foodservice activity has never been busier and popularity of the retail range, which comprises authentic Greek Style, Greek Style Thick Set, Low Fat and Wholemilk yogurts, continues to grow. The yogurts are multi-award winning. This is great testimony we hope to our Greek heritage, passion, skill, experience and the family story of our lovely yogurts. Try our delicious family recipe from the early days – Greco Rosa Crema.